SALT LAKE CITY and TULUM, QUINTANA ROO, Mexico, Feb. 04, 2019 (GLOBE NEWSWIRE) -- Overstock.com, Inc. (NASDAQ:OSTK) announced its blockchain-meets-property rights subsidiary, Medici Land Governance has signed a Memorandum of Understanding (MOU) with the municipality of Tulum in Quintana Roo, Mexico to develop a digital land records platform. 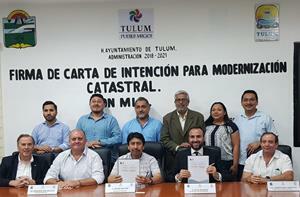 According to the terms of the MOU, Medici Land Governance (MLG) and Tulum officials will work together to collect real property ownership information for a defined area of Tulum Municipality to protect the land rights of its citizens, resulting in a mass issuance of certificates of title to land and related processes. MLG and Tulum officials will also collaborate to create a method for automatically capturing and recording subsequent land administration transactions and updates to the digital platform. Medici Land Governance was founded in 2018 to put the power of property ownership and equity into the hands of the masses by applying blockchain and other technologies to provide low-cost, easy-to-use land administration systems. MLG is a portfolio company of Medici Ventures, Overstock.com’s wholly-owned blockchain subsidiary founded in 2014 to apply blockchain technology to existing markets in order to democratize capital, eliminate middlemen, and re-humanize commerce. Today, Medici Ventures oversees a global portfolio of companies building the foundation of a "tech stack for society" based on trust systems that utilize blockchain and other related technologies instead of frictional middlemen. Medici Ventures' portfolio companies are introducing blockchain technologies to industries such as capital markets, money and banking, identity, property, voting, and supply chain.